Bird by bird is my motto these days - one word, one sentence, one paragraph at a time. Have a beautiful Easter week! Exactly. . . one step at a time. Just keep plodding in the right direction. I am often paralyzed into inactivity by the size of the task. Today, I have many "thank yous" to write for my recent birthday, and bereavement cards to send and a couple of gifts to send in the mail. All of these tasks are small but those are three tasks that I need to remember "bird by bird." Excellent advice in memorable words! I think Anne is an amazing writer and has so much to share. I have several of her books. I do wish that she would always elevate the language however. I'm one of the squeamy ones who doesn't care to go from one perfectly beautiful sentence to one laced with strong language. I love this story. I thought of it recently when confronted with a big task. 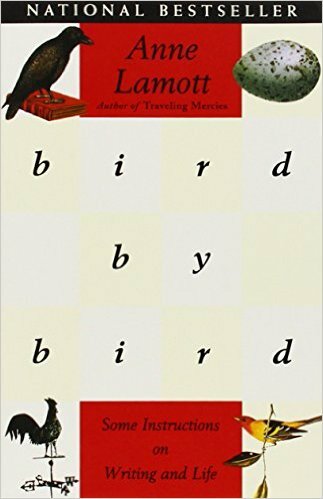 Ann Lamott is remarkable! Working at a High School, there is always a student so stressed. I tell them to take it hour by hour. And if that doesn't work, 5 minutes by 5 minutes. Bird by bird....very apropos in this spring season, when my yard is full of robins! I like your new look!